Do you want to reach out to others and share your faith within the community? Through our local missions, we as a church can serve those in need and spread God’s Word locally. We have seasonal and year-round efforts, so if you’re looking to make a difference in our community through volunteering or donating, we have many opportunities to do so. If you’d like to extend the reach of your service, you may also be interested in our Global Mission work! Hales Corners Lutheran has partnered with Pastor Joe Robb and LINC Milwaukee in a comprehensive and coordinated effort to impact the city with the Gospel. LINC Milwaukee is a network of local churches and ministries that have joined together in a common mission to impact the City of Milwaukee with the love of Christ. Click below to learn more, or visit LINC on Facebook. Ebenezer Stone Ministries is a non-profit organization serving the south side of Milwaukee, WI from their facility located at 35th and Scott. Current programs offer a food pantry, meals, and community assistance connections. Coming soon they will also offer classes on job preparedness and personal finances. Take a look at Ebenezer Stone’s website to find out how you can volunteer and/or support their mission! 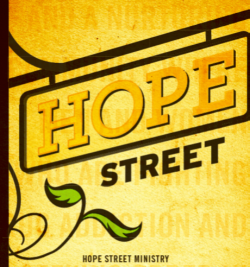 Hope Street Ministry is a safe place for people who suffer from addiction and toxic environments to seek shelter from the storms of life and an encouraging Christian community in an effort to begin to heal in their brokenness. Hope Tree reaches out to the families of inmates at the House of Correction by helping to meet the physical, emotional, and spiritual needs these families may have. Hope Tree coordinates with churches and other organizations to provide Christmas gifts for a child of an incarcerated parent/guardian. Chicks with Sticks is a ministry for individuals of all skill levels in knitting and crocheting. Members work on and share their own projects and learning experiences and make items for various charities. In particular, knitted and crocheted hats, mittens and scarves are made for the Ebenezer food pantry. The group meets in the small conference room (2046) on the 2nd and 4th Sundays of the month from 6:30-8:00pm - September through April. For more information, contact Cheri Huffer-Alt at chufferalt@hcl.org. The Warm Hugs Quilt Group makes approximately 100 unique cotton quilts each year and donates them to various ministries. The group meets in the Steeple View Craft Room on Mondays at 9:30-11:30 am and every 2nd Tuesday at 6:30 pm year round. For more information, contact Sue Lawler at 414-427-5101.